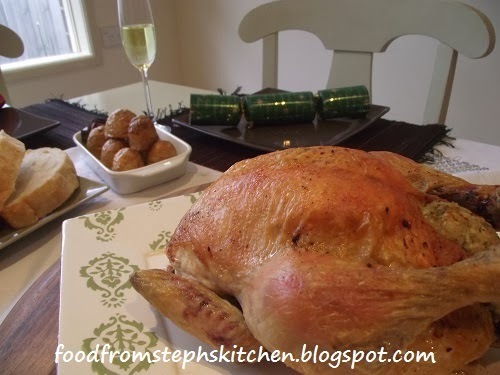 With Christmas almost here I've been slowly putting together my Christmas lunch menu. I'm really excited this year because my family is flying in to spend Christmas with us, and it'll be the first Christmas I've been able to have with them in five years. It hasn't been that we didn't want to spend Christmas together; the last few years have been filled with expenses that just haven't enabled us to fly back to my home town. 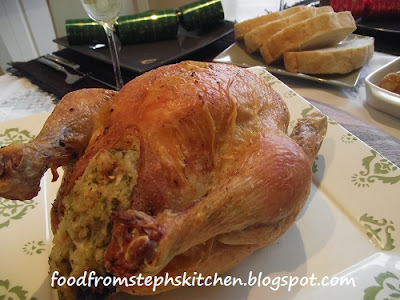 Although my Christmas menu does seem to chop and change often, one thing has stayed on my menu from the start: Roast chicken with apple and thyme stuffing. The stuffing is a variation of what my Mum used to do for a quick stuffing. She would chop up onion and apple and stuff it into the chicken with some bread to make a sweet chunky stuffing. Funny enough before Mum started doing this I never considered apple with chicken, as I thought it was a pork thing - but it goes amazing! Over the years I have adapted the stuffing to be even more lazy then my Mum's quick stuffing. 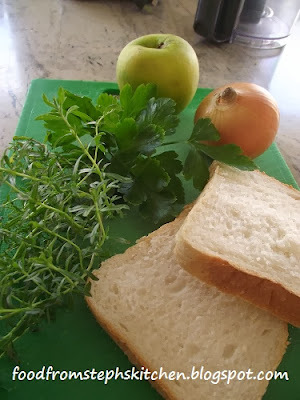 I know use my food processor instead of cutting up anything, which also allows me to not use any water as the apples use the moisture to bind everything together. You'll see what I mean when you read over the recipe. You can literally have the stuffing ready in under five minutes, even making it up a head of time and keeping it in the fridge. The stuffing also uses five very common ingredients. In my experience a 2 kg chicken will feed around four adults with your roast vegetables and the other usual suspects for a roast dinner. 1 large apple / 2 small apples (green or red) - peeled, cored and cut into quarters. Pre-heat your oven to 180 C / 350 F.
In a food processor throw in your onion, thyme and parsley. Turn on the food processor and blend until the onion appears to be finely chopped. I like to add the onion in first so that you don't even up with larges chunks in your stuffing while everything else is finely cut. Next add in the apple followed by your bread torn into large pieces. I like to add a little bit of pepper to my stuffing but like to leave out the salt. I do this because I find it doesn't need it, and I try not to use too much salt in my cooking. Blend again until everything is mixed through and is finely cut. The apple in the stuffing will at that little bit of moisture you need to keep it all together, so you don't need to add any other liquids like you might have in other stuffing. Before stuffing the chicken I like to rinse it first under some lukewarm water. I like to rinse out the chicken cavity as well to make sure there isn't any blood or things inside before my stuffing goes in. This is a personal preference so you don't have to do this step. To stuff the chicken I like to use the bowl from the blender to prop the chicken up onto. 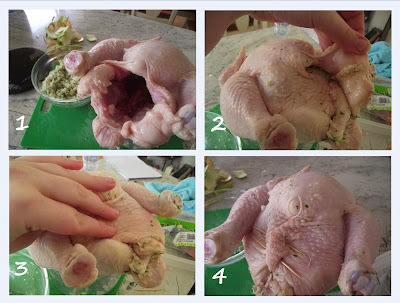 Remove all the stuffing from the food processor bowl into a small bowl, then prop the chicken on top so that you can easily stuff the chicken. Pull the fatty bits on the sides of the opening to the side as we'll use them to close up the chicken later. Once you have added all or as much of the stuffing as you can pull the fatty skin on the sides over each other to close the opening as much as you can, even pulling them together tightly so that as little of the stuffing is showing as possible. Use toothpicks to pin the sides together and over the opening. Others might use cooking twine but honestly that is too much effort for me. In a large baking dish place a sheet of baking paper on the bottom, making sure that it sits up over the dish at least by a couple of centimeters. You don't have to put the baking paper down but I just find that it makes things easier later on to clean up, as you don't have things baked onto the bottom of your tray. Having that extra baking paper sitting over the sides of your dish also stops oil spitting up onto the sides. Before popping it in the oven I simply drizzle a little bit of olive oil over the top, rubbing it into the skin of the chicken so that it's all over, and then sprinkle little bit of salt and pepper over the top. You can also sprinkle with a little bit of thyme as well. A good rule of thumb for chicken is cook it for 40 mins on 180 C (350 F) for every 1 kg. 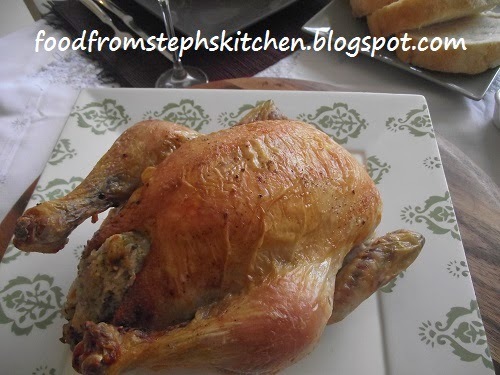 As we use a 2kg chicken for this recipe we bake the chicken for 80 mins. However, with chicken you always need to check the chicken is completely cooked through. It isn't like beef where it can be still "pink". To check simply take a skewer (or small knife if you don't have one) and pierce the chicken through to the meat. Remove the skewer and see what colour the juices are that run out. If the juice has any sort of red or pink colour to it, cook it for another 15 mins and check again. If the juices run clear you know your chicken is ready. Before cutting the chicken make sure you rest it for at least 10 - 15 mins. You might think resting is just something that chefs rant about as being the "proper way" of doing things (like I used to), but if you rest it you won't have all those juices leaking onto your serving plate and creating a pool of liquid under your meat. And that is that! It is always so easy, and just tastes so good. I like to serve mine with gravy as well, but you really don't have to; my family is English ... gravy comes with everything!